The above fish is 1200 times more lethal than cyanide and I ate it! 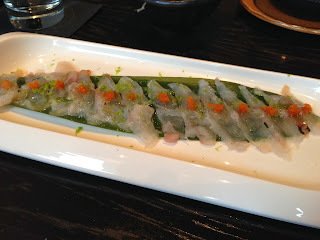 Ok more backstory, we were at our new favorite sushi restaurant here in Austin and the Chef offered us the Fugu / Puffer fish. A rare honor considering they only had two and don't stock it. So more on this deadly fish. The toxin is stored in several places but most notably the liver. Improper preparation of the fish can result in the release of the toxin and death to the eater. The toxin: Tetradotoxin, shuts down the ability for your nerves to conduct electricity paralyzing your muscles ultimately shutting down your ability to breath. Usually the effects start/end anywhere within 10-45 mins of consumption (yes I was watching my watch and wondering if I was really feeling a tingling sensation in my fingers) There is no cure or antidote, they basically have to keep you on life support until you've metabolized the toxin and can start breathing again that's assuming you're able to get the hospital in time. Why? well, among the many foodie "lists of food you've eaten" I usually score pretty high. But most common to all of the lists is the deadly puffer fish. Always there preventing me from scoring a 100%. It's on my "bucket list" probably one of the few items that could actually cause a kicking of said bucket. I've heard of this "delicacy" as long as I can remember and honestly when the opportunity finally presented itself I was a little frightened. My wife's enthusiastic "let's do it!" pushed me over the edge. Also we trusted the chef. 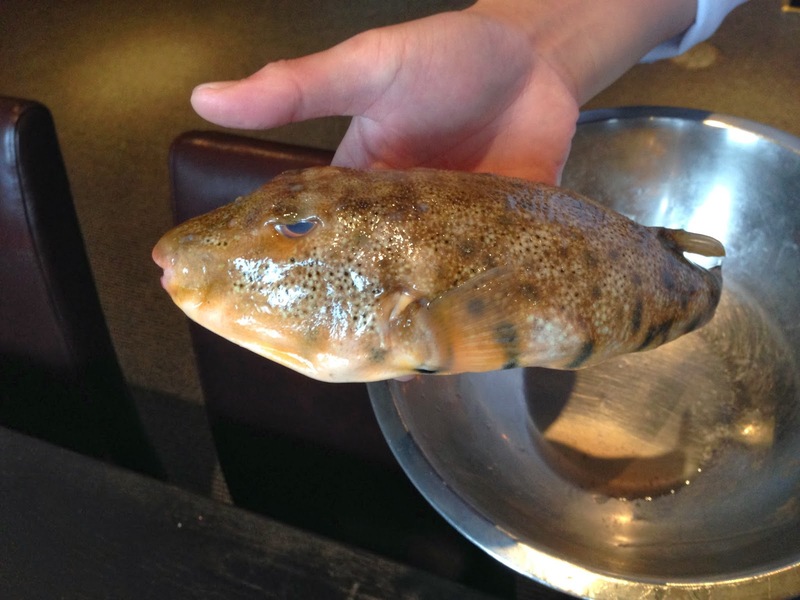 Chef explained Fugu preparation, sale, and training are all highly regulated in the country of Japan. It takes a minimum two year apprenticeship training program where you practice cutting the fish and are required to eat the fish you prepare. So failure during apprenticeship is probably a "one time" deal. Most deaths occur from people catching a puffer fish and trying to prepare it themselves (without training). So no Fugu bento in the future. The chef did re-iterate he went thru the training and ate a lot of puffer fish in his time in Japan working in the sushi restaurants. 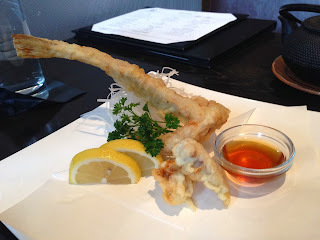 Fugu cheek tempura. The spin and fins were tempura fried along with the two "cheek" morsels. The meat was very tender and delicate, it still had some of that gamey flavor to it. Parts of the spine had a bitter taste to it. This served to us as you see it we had to share this plate. Finally Fugu sashimi. 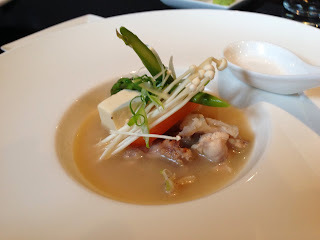 The Chef used a lemon peel with yuzu sauce which was a great pairing with the fish. The texture is a little hard to explain, the meat is very chewy not a Squid/Ika chewy that has something of a snap to it but similar. The meat also reminded me of red snapper a bit translucent. The chef made it a point to tell us to chew on the fish just a bit and the flavor will develop. The oil from the lemon peel really complemented the fish's flavor. I have to apologies because I can't think of a single comparable texture or taste to explain the experience. I did experience the slight tongue tingly sensation after the meal. We were each served with one of the above plates. Ok bottom line would I do it again? Well there's two ways to ask that: would I make the same decision having not had fugu before? Yes! Would I roll the dice again? Probably not, better to leave a winner. I'm glad I had the chance and enjoyed the experience.